Here at Viget, our PMs have got project management down, and we pride ourselves on filling something closer to the newly touted digital project manager role. While our roles conceptually aren’t too far from a “traditional” project manager, we use different tools and different processes, all with an aim towards creating the best digital products and experiences. A lot of times, when we say digital, we mean “web” (yes, that includes the mobile web). But what happens when the web component needs some sort of physical presence? Historically, we’ve relied on our clients to bring the physical executions of our digital experiences to life, whether that’s executing print materials to promote a new site, installing in-store displays to highlight our responsively-built ecommerce campaigns, planning launch parties, or handling fulfillment of online orders. Aside from facilitating photo and video shoots for our clients, our PMs typically deal with the ever-changing world of software. That’s why it was such an interesting challenge to partner with Baldwin& on a recent hardware installation for Ponysaurus Brewing, just a stone’s throw from our Durham, NC office. 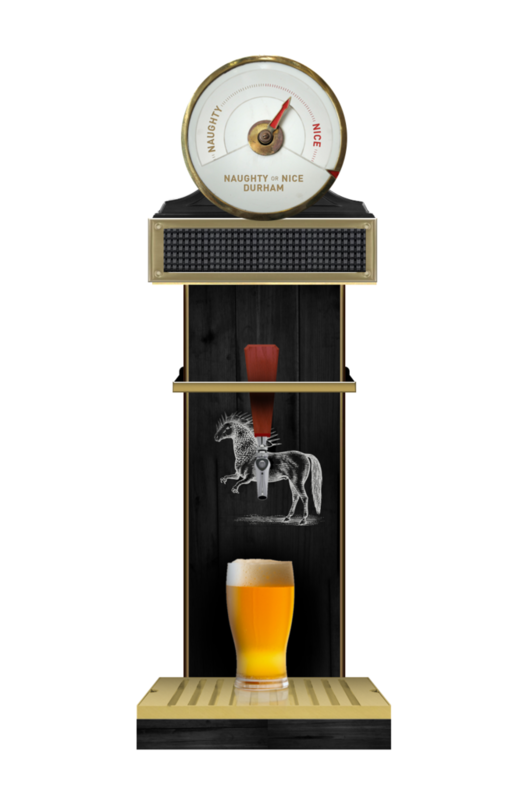 While our team did indeed build a software back end for the brewery’s Holiday Spirit Measurer Thingy, the more time-intensive and complex piece of the installation is a physical machine with multiple moving parts; a bell, a “niceness” dial, a tap-locking arm, a scrolling LED marquee to display messages, and a full tap hookup. 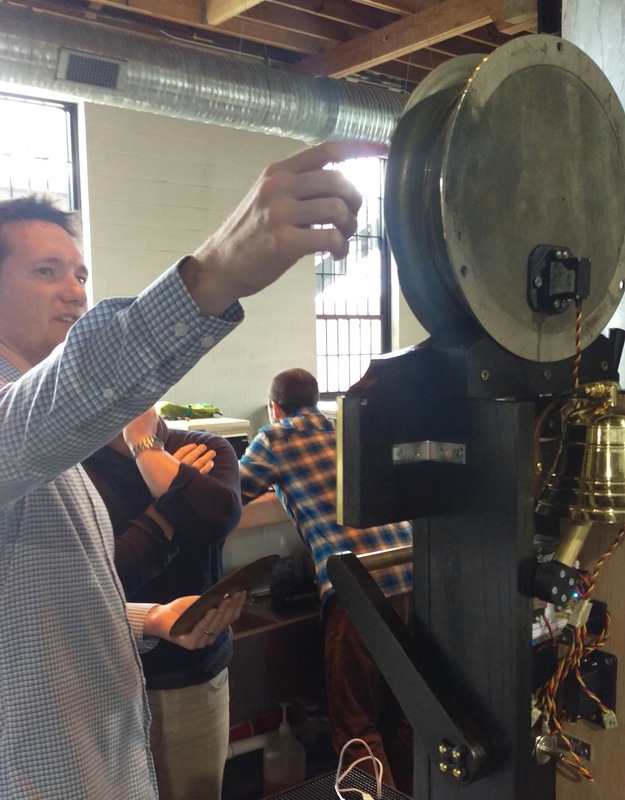 In short, we built a device that indicates the sentiment of tweets in Durham, and when the city is deemed nice enough, a tap pouring a special holiday beer is unlocked, and patrons can rush to the bar to sample the brew. For more details on what the installation entailed, check out Justin’s blog post detailing the project. I was lucky enough to work with Ben Eckerson, fellow PM/Strategist on the project, and Justin and Eli on our hardware team. While this wasn’t their first hardware rodeo, I personally learned a lot. Below, I’ll share a few such lessons from My First Hardware Project™. For the Ponysaurus installation, it was important to get the design of the machine right from the get-go. This was a complex piece of hardware; multiple servo motors power each distinct piece of the device, and everything needed to fit in one structure that could sit neatly on the bar and not get in the way. What’s more, Justin and Eli built the device in our Boulder, CO office and Justin only had a couple days in Durham to test it out in the space. So we knew we’d need to get it right the first time. The physical dimensions of the device. How the hardware itself interacts with the software, which parts would be controlled by a servo motor, and which parts would be controlled manually. Pictures of the space. Since Justin wasn’t able to see the space before he delivered the finished device, Ben and I took as many detailed pictures as we could of the bar so he could get a sense for location and what might surround the device. Early design of the device. … except for the pieces that can be added later. While we decided on as many details as possible up front, a few features needed to be changed and added during the build process to make the device a more compelling installment at the bar. After the initial plans were finalized and the design completed, the team agreed that an audible element alerting patrons that the beer was ready for pouring would take things up a notch. Luckily, we still had space on the device and room in our budget to add a nautical bell that rings as the tap is opening. Justin added another servo to power the bell arm, Eli hooked it up to our “victory sequence,” and we were good to go. Since we were able to add this on to our existing (rather than having to rework how the machine was built), it was a pretty simple addition. Another add-on was the final design for the face of the dial. The device has a needle that moves back and forth indicating niceness level, with the face of the dial indicating just how nice or naughty Durham is at that time. Since this design needed to be printed and it wasn't going to be ready until launch day, we made sure that we could easily remove the dial cover and the needle so we could install the designed faceplate without having to disassemble the entire machine. This was an easy process that we tackled during final installation. While it's great to plan out as much ahead of time as possible, some creative thinking with these hardware projects will let you add items on later. Ben gets ready to add the dial face, while Justin makes some changes to the code in the background. 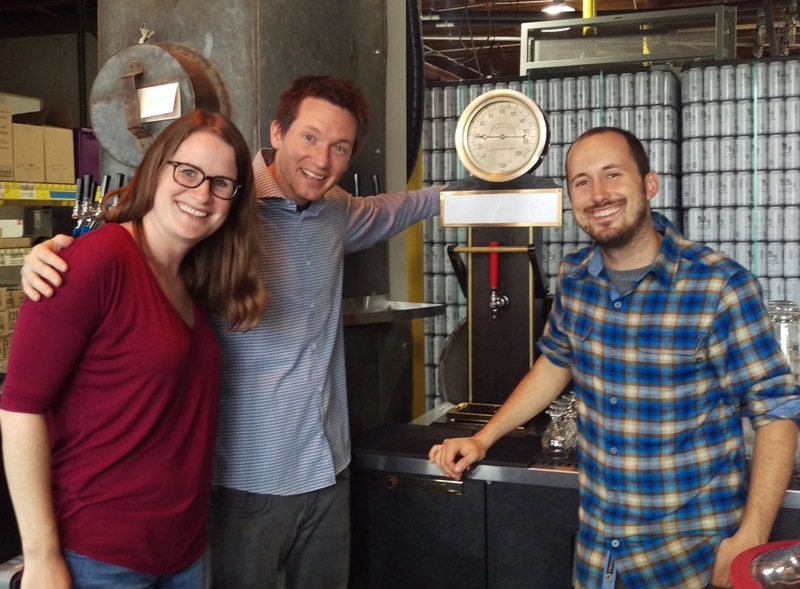 While the sketches, designs, and specifications gave us a good sense of how the device would work, we didn’t know exactly what it would be like once the device was set up in the space, tracking and displaying real data, and pouring real beer. Figuring out the best power source for the device. Making sure it was plugged in, and wouldn’t lose power during business hours. Devising an “offline” mode for the device, so we could continuously live-stream the device and even show messages when the bar was closed. Finding just the right position and set up for the live stream webcam. Calibrating the needle position to make sure it aligned with the dial face. Beer hookup. It was largely left up to the brewery to hook up the machine to the keg. We made sure we installed a standard working tap and tap line to the back of the device, but these were removable in case they weren't compatible. Pouring times. Because the tap is open for a limited time, we wanted to make sure bartenders had enough time to get to the tap and pour samples, but not open for so long that the scarcity aspect was compromised. Here at Viget, when delivering final products, we typically like to have everything finalized, 100% QAed, and have airtight deployment processes once a project is launched. In this case, we took a more collaborative approach, making changes during installation and even updating code once the bar was open and users were interacting with the device. During this time, it was important for us all to remain flexible and open to adjustments and ensure that Ben and I were able to assemble and disassemble the device to help troubleshoot any issues on site (typically on our software projects, we leave the “build” aspect to our devs). Taking a break from installation to pose with the device. We get to do lots of user testing here at Viget. In those cases, users are usually prompted to share what they’re thinking as they interact with a web app or site. When interacting with a physical device in the “real” word, they tended to be much more vocal. I posted up at the bar the first night we “beta-tested” the Ponysaurus device, and observed lots of questions, cheers, and general merriment when patrons observed and interacted with the device. And, it was great to see the bartenders in action pouring samples. Interactions took more time than we anticipated; bartenders clean each glass before pouring samples, and poured full pints of the special holiday brew in addition to the samples, so we increased the amount of time the tap would stay open to allow for these longer interactions. It was also great to see bartenders explaining the device to excited customers; it added another touch point that we don’t get to see with our web-only apps. Sometimes user testing and observation necessitates sampling some beer.